There are many ways to configure a website for all screens. Factors to think about include the cost, time to build, your available human resources and infrastructure, and the needs of your customers. Whatever configuration you choose, as an underlying principle we strongly recommend that you serve all your sites from a single domain, like example.com. In particular, if your desktop site is hosted on example.com, don’t put your mobile site on a separate domain, like a.com/example. Stay with a single domain and you’ll build brand and URL equity with your users. With that principle in mind, let’s look at the three basic ways you can build a mobile-friendly website: responsive design, dynamic serving, and a fully separate mobile site. Responsive web design (RWD for short) is a clever design technique that uses a single HTML code base for all platforms. That is, all viewing devices read from the same code on the same URL. The content resizes itself to fit the screen being used, based on pre-defined breakpoints and fluid grids. RWD requires solid up-front planning. Costs can be high at first, but once the device-specific strategy is set, maintenance can be less resource-intensive. · One URL for all content. Using a single URL for a piece of content makes it easier for your users to interact with, share, and link to your content. It’s also easier for search engines to discover and index your content. · A streamlined user experience. Presentation of all content is customized, and device-specific features can still be used. · Flexible orientation. RWD naturally allows for landscape or portrait device orientation changes by users. · No redirects. Load time is reduced and performance increased. · Careful planning required. Since all HTML is shared here, careful planning is a must to develop a truly custom and robust experience with optimal performance for each device and user. Businesses that are focused on offering a consistent experience and can plan holistically for all devices with a single web team. (Starbucks.com, BostonGlobe.com and Time.com all use this approach.) RWD can be expanded to fit new devices as they emerge, and the single URL is good for linking and sharing articles without confusion or redirects. In this method, the web server detects the type of device a visitor is using, then presents a custom page designed just for that device. Custom pages can be designed for any device type, from mobile phones and tablets to smart TVs. · A custom user experience. Each user gets content and layout created just for their device. · Easier changes. Adjust content or layout for one screen size without having to touch other versions. · Faster loading. Your team can streamline content for optimal load times on each device. · Single URL. 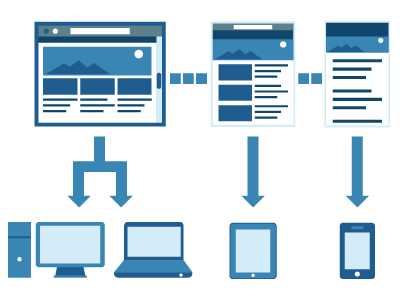 As with Responsive Design, Dynamic Serving keeps all your users on a single URL. · Content forking. Multiple custom pages mean multiple sets of the same content. Unless you have a sophisticated CMS in place, keeping content up to date on all device-specific pages can be challenging. · Faulty device detection. Your servers will need to run scripts to recognize all available devices. This step prevents problems like the server sending a mobile-optimized site to tablet users. Your webmaster will need to keep the directory up-to-date and running smoothly to avoid bad detection or gaps in service. Another common mistake is that the server assumes a device orientation, most commonly portrait, but the user may be holding the device in a different orientation (ie landscape). · Changing experiences: Users will be confused if you have multiple sites and they appear radically different. While it’s important to customize for each screen size, your brand look and feel should be recognizable in all formats. Dynamic serving is a resource-intensive solution for companies that make frequent changes to their website, and who often need to adjust display for one device, such as tweaking only their mobile site. A capable IT staff (or vendor) is a must to manage the different and possibly complex sets of website code required. A third option is to simply create a mobile site that’s separate from your original desktop site. Your system detects mobile visitors and redirects them to your mobile-optimized site (often using a sub-domain like m.yourname.com). Only mobile users will see the separate mobile site. Users of tablets, Web-enabled TVs or other devices will still see your original desktop site. · A custom user experience. This gives you the most freedom to create a separate mobile site that is designed only for mobile users. · Easier changes. Content or design changes can be limited to the mobile version of the site, with no effect on other devices. · Multiple URLs. Sharing a web page requires careful redirects and integration between your mobile and non-mobile sites. Redirects also lead to longer page load times. · Content forking. Keeping two different sets of content can make data management more complex. · Faulty redirects. When a mobile user lands on a deep desktop page, make sure they aren’t redirected to your generic mobile homepage. Also important: avoid smartphone-only errors, where a desktop URL redirects to a non-existent mobile URL. · Missing annotations. The two-way (“bidirectional”) annotation helps Googlebot discover your content and helps our algorithms understand the relationship between your desktop and mobile pages and treat them correctly. · Inconsistent user experience: People who look at your smartphone site should recognize it as the same business they see on your desktop site. This prevents confusion and a bad overall user experience. Businesses that for any reason need to manage their mobile site independently. For instance, some businesses may want to use a different vendor for mobile, or may want a mobile structure that simply wouldn’t be possible with RWD. Since setup is relatively easy and can be quite cost-effective, a separate mobile site can be good for small businesses with more basic site needs.